A new rule making it easier for air and rail unions to be decertified smells suspiciously like retaliation. SNAP benefits are already too low, leading to rationing and other hard choices when they run out after a few weeks. McConnell said he would support the emergency declaration, which legal scholars have called dubious. Trump is refusing to sign a funding deal that includes back pay for federal contractors. Trump may still declare a national emergency — or plunder disaster funds to get his wall. Air traffic controllers and other airport workers were widely credited for ending the longest shutdown in US history. 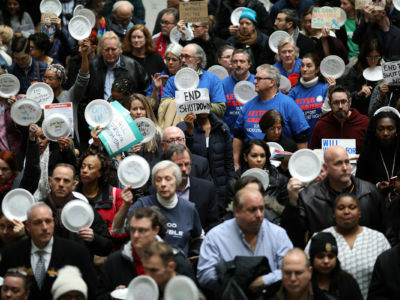 An estimated 4 million federal contract workers are not currently legally entitled to back pay following the shutdown.